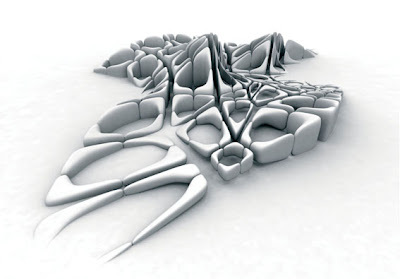 Though parametricism has its roots in the digital animation techniques of the mid-1990s, it has only fully emerged in recent years with the development of advanced parametric design systems. Patrik Schumacher explains why parametricism has become the dominant, single style for avant-garde practice today and why it is particularly suited to large-scale urbanism as exemplified by a series of competition-winning masterplans by Zaha Hadid Architects. There is a global convergence in recent avant-garde architecture that justifies its designation as a new style: parametricism. It is a style rooted in digital animation techniques, its latest refinements based on advanced parametric design systems and scripting methods. Developed over the past 15 years and now claiming hegemony within avant-garde architecture practice, it succeeds Modernism as the next long wave of systematic innovation. Parametricism finally brings to an end the transitional phase of uncertainty engendered by the crisis of Modernism and marked by a series of relatively short-lived architectural episodes that included Postmodernism, Deconstructivism and Minimalism. 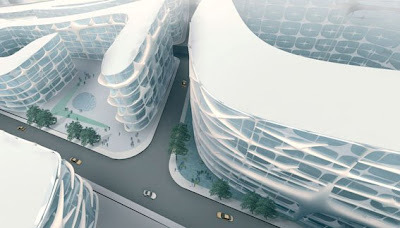 So pervasive is the application of its techniques that parametricism is now evidenced at all scales from architecture to interior design to large urban design. Indeed, the larger the project, the more pronounced is parametricism’s superior capacity to articulate programmatic complexity. Avant-garde architecture and urbanism are going through a cycle of innovative adaptation – retooling and refashioning the discipline to meet the socioeconomic demands of the post-Fordism era. Fabric study. The urban fabric comprises both cross towers and perimeter blocks. The image shows the morphological range of the perimeter block type. Blocks are split into four quadrants allowing for a secondary, pedestrian path system. At certain network crossing points the block system is assimilated to the tower system: each block sponsors one of the quadrants to form a pseudo-tower around a network crossing point. Fabric and network. This masterplan for a new mixed-used urban business district in Singapore was the first of a series of radical masterplans that led to the concept of parametric urbanism and then to the general concept of parametricism. 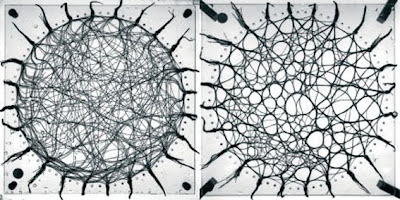 Analogue models for the material computation of structural building forms (form-finding) are the hallmark of Frei Otto’s research institute. 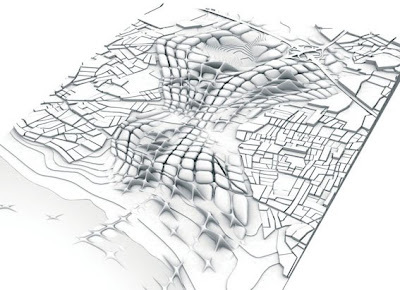 The same methodology has been applied to his urban simulation work. The model shown integrates both distancing and attractive occupations by using polystyrene chips that cluster around the floating magnetic needles that maintain distance among themselves. Depending on the adjustable parameter of the thread’s sur-length, the apparatus – through the fusion of threads – computes a solution that significantly reduces the overall length of the path system while maintaining a low average detour factor. 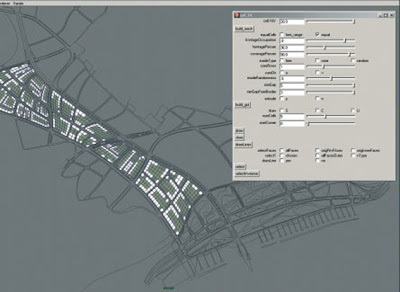 Parametricist urbanism aims to construct new field logics that operate via the mutually accentuating correlation of multiple urban systems: fabric modulation, street systems, a system of open spaces. Maya hair-dynamic simulates minimised detour net. The path network was thus generated with a digital woolthread model. The set-up registers the multitude of incoming streets and bundles them into larger roads affording larger parcels. Scripting calligraphy block patterns. Various scripts were developed that configure the perimeter blocks depending on parcel size, proportion and orientation. The script also allowed for random variations regarding the introduction of openings within blocks. New cityscape. The Kartal-Penkik plan incorporates a vast quarry that becomes the largest item in a system of parks that are spread throughout the urban field. The rhythmic flow of the urban fabric gives a sense of organic cohesion. Close-up of cross towers. The cross towers produce the urban peaks. Through their ground-level articulation these tower complexes participate in the creation of a continuous urban fabric that frames the streets and occasionally widens the street space into semi-public plazas. 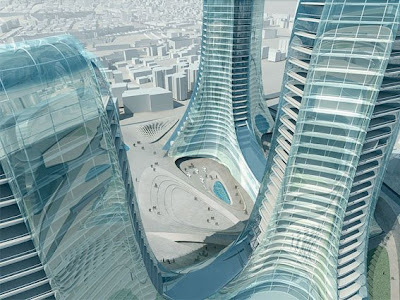 This is achieved while maintaining total continuity between the podium-like ground fabric and the shafts of the towers. Calligraphy blocks – tectonic detail. The articulation of the facades is a function of the location within the urban field. The exterior of the blocks is given a heavier relief than the interior. Where a block opens up and the public space flows into the private courtyard, a semi-private zone is articulated via the gradient transformation between the outer and inner articulation. Seems to me the new paradigm in architecture is not so much form based as it is performance based. 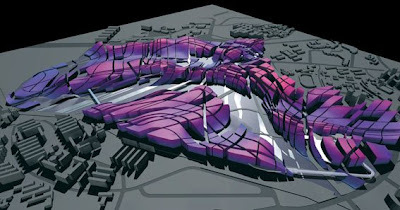 Not that the two are necessarily mutually exclusive but parametricism will have to prove its efficacy in terms of addressing the issues and even crises that we face today and tomorrow. I hope that our profession will not be so self involved in developing new ways to make different looking buildings that it fails to fulfill its obligation to address issues of sustainabilty.